Humans of Bombay has successfully raised funds & reached the goal amount. We thank all the 1319 generous supporters for their kindness. Karthi needs your support to win this battle against life. The funds raised will be used for his treatment. “I’ve become so big now appa, I’m going to be in second standard!”, I still remember how excited Karthi was. He smelled the pages of his brand new books while we were putting brown covers on them. It’s been three months since all his friends started going to school and my Karthi has been left behind. He has been to class only twice, that too because the medical certificate I carry everywhere couldn’t relieve him from that particular exam. The day we finished the registration process for his class, we also received his alarming reports, so we got him admitted the very next day. Today my 7-year-old son has a swollen face, acidic stomach and dysfunctional liver because of a severe liver disease. With more than 50% of his liver not supporting his system, we need Rs. 25 lakh to save his life before it fails. He needs a liver transplantation in the first week of November. Every moment, the realisation of being far from the amount that’s required to save my baby’s life hits us and terrifies us. Please help me out - I don’t want to lose my son. My name is Rajshekhar Nadar. I live with my wife, Karthi and my younger son. I deliver gas cylinders for a living and makes Rs. 25,000 every month. My wife takes care of the house and our children. I’m the only earning member of my family - no matter how many cylinders I deliver in the next month, we won’t be able to reach that number, not even in our dreams. The needles, the biopsies, the endoscopies, all are a stark reminder of how badly we want to see our son healthy and how much money that’s going to cost us. Karthi’s health has been sensitive right from the start. When he was born, for the first ten months, everything was fine, but suddenly after that everything changed for the worse. He got fever and symptoms of what the doctors thought was jaundice. For almost a year, we spent Rs. 70,000 on his tests only to find out that this is a different kind of jaundice that needs attention from bigger hospitals. 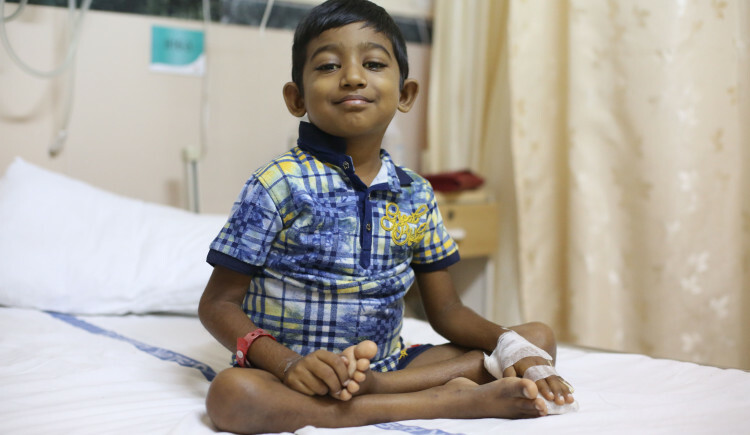 After a few more tests, the doctors at the Jaslok Hospital said that he’ll have to get checkups every 3 months till he becomes old enough to get a transplant. So it’s been over 6 years since we started taking rounds of hospitals and so far, we’ve spent a total of Rs. 1,48,000 for his check-ups, tests and medicines. How we’ve arranged seems pretty unbelievable in retrospect. With God’s grace things have worked out for us so far. Relatives, company that my husband works for, parents, savings, we’ve stretched our hands in front of every source of help we could think of. But now we’ve exhausted everything. If we don’t get him operated in the first week of November, the risk level will rise and his liver may fail. We’re trying to sell our land back in our village in about Rs. 5 lakh but such deals take time to process. That’s the last option we’re left with. Where will I get the rest of the money for the transplantation from? It’s a scary question that I don’t know the answer to. 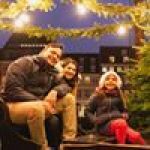 Your support in the form of donations can help me pay for my child’s treatment. 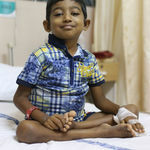 Since the last 5 days, Karthi is in the hospital battling some of the worst symptoms of this horrible disease. His arms and legs are swollen. Sometimes his mouth starts bleeding even when he’s just talking. There are times when he wants to eat but he’s not allowed to. How can you say no to your own child when he cries and says he’s hungry? The glucose pipes inserted in his body are providing nutrition to his body right now. He’s restless all the time - he struggles to fall asleep at night. My wife and I are up all night telling him stories or singing him lullabies. The most heartbreaking is keeping him away from the things he loves the most - playing with his friends and his school. There was a time when Karthi used to be silent only while sleeping. Otherwise he would just run around the house and in the park throwing the ball around. When I see such a big difference in his behaviour, it’s really upsetting. He keeps asking us every now and then when he’ll be able to go to school. We have no answer to that right now because we don’t know when we can get him medically fit to attend school. We’re just a few days away from our deadline. This transplantation could give Karthi the childhood that has unfortunately been lost in these hospitals. His mother and I really want to see him healthy and happy again. We would do anything to save his life. Unfortunately, after trying everything in our power, we’re still falling short of funds to afford the treatment that could change his life. We really need this - no 7-year-old deserves to spend most of his time lying in a hospital bed rather than a park or in his class. Please help us give him a better life by donating to our fundraiser on Ketto. Feel free to ask Humans of Bombay for a new update on this Fundraiser. [Please Watch The Video Message] “I’ve become so big now amma, I’m going to be in the second standard soon and I can't wait to go back to school!” Baby Karthi had a swollen face, acidic stomach and a dysfunctional liver because of a severe liver disease. With more than 50% of his liver not supporting its function, he was in an urgent need of a transplant. A fundraiser backed by your love and support enabled him to get the all important operation. Your message will be directly emailed to Humans of Bombay and you will receive his/her response on the email address entered below. Your message will be directly emailed to Karthi and you will receive his/her response on the email address entered below.